Greetings again from the darkness. As a filmmaker, the public’s expectations become a burden rather than a blessing once you write and director back-to-back movies like The Sixth Sense (1999) and Unbreakable (2000). 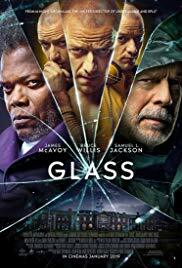 M Night Shyamalan has never been able to replicate the box office or critical success that he enjoyed with those two films … but, oh how he has tried. It’s this latest that finally makes us believe he is at least having fun again. James McAvoy plays Dennis and Patricia and Hedwig and … well … he plays a guy with 23 distinct personalities. As you might imagine, some of these personalities are nicer than others, while some are stronger in their fight for the spotlight. As Dennis, a button-upped neat freak, he captures 3 teenage girls and holds them captive. At first, the purpose is a bit murky, but the delay does allow the girls to meet some of the personalities. The girls are Casey (Anya Taylor-Joy, who was so good in The Witch), Claire (Haley Lu Richardson from The Bronze), and Marcia (Jessica Sula). Claire and Marcia are the popular girls who react with typical teenage emotions, while Casey pushes for patience and observation. It’s Casey who may be the film’s most interesting character as childhood flashbacks occur that are first thought to explain her survival skills, but soon enough disclose a darker, more unfortunate past. The younger Casey is coolly played by newcomer Izzie Coffey, and holds her own with Sebastian Arcelus (her dad) and Brad William Henke (her Uncle John). The always terrific Betty Buckley is outstanding as Dr Fletcher, the psychologist treating McAvoy’s character(s). Ms. Buckley adds class and a connection to the real world that gives us hope for the future of the girls being held. McAvoy really seems to be enjoying the acting challenge and shape-shifting that accompanies this mental disorder, and he will likely creep you out a few times. Cinematographer Mike Gioukakis was a key to the look and mood of It Follows, and his camera work here is superb in mostly confined areas. Sure, the whole thing is preposterous, but it’s fun and wicked … and with this director, you can expect a surprise or twist – even after all these years. Greetings again from the darkness. If you have read many of my reviews, you are aware that if I didn’t enjoy watching it, I won’t enjoy writing about it. Also, I (foolishly?) refuse to give up hope on writer/director M Night Shyamalan. If such a creative mind (The Sixth Sense) can go so flat, what possible chance do I have? While much has been written about the influence of Scientology on this project, I can only speak to my personal reaction to the movie and story, not the possible ties to that organization. Will Smith has proved many times that he is quite a charismatic screen presence when the material allows. However, his role here compares to telling Elvis Presley not to sing or swivel his hips. Smith plays General Cypher Raige, the most courageous Ranger from an advanced civilization living 1000 years in the future. His young son Kitai is played by Smith’s real son Jaden Smith (The Karate Kid remake). The elder Raige is a super soldier, but a lousy father. Kitai wants nothing more than to become a Ranger and prove himself to his legendary father, while redeeming himself from an earlier mishap that had him watching his big sister (Zoe Kravitz) get killed. The movie kicks into gear after a crash that finds only two survivors … father and son Raige’s … stranded on an inhospitable Earth. Except for a few pretty lousy looking special effects (CGI), a very pissed off Earth is the best part of the movie. The worst part is a near lifeless (double meaning) father Raige tracking the younger Raige on a near impossible mission, all while confined to the wreckage with two broken legs. Somehow this advanced civilization has only invented a weapon that would be effective and cool in today’s world. It seems pretty antiquated when fighting off Ursa, the blind beast that smells fear in humans. Only those who show no fear have a shot at survival. And that’s pretty much what this movie is about. Man against “Nature”, and Man (boy) overcoming his own fears. The story is interesting enough and Earth is fascinating, though could have been ever better. What doesn’t work is that Jaden Smith just isn’t yet at the level to carry a movie of this level. His emotions are limited to furrowed brow and looking longingly at his dad. Even worse is watching Will Smith incapacitated and stoic in his every move. The movie gives every indication of a pet project that Will Smith developed as a star-making outing for his son. Heck, we all wish we could do such for our kids. Unfortunately, better timing and a better fit would have upped the odds that it would pay off for the Smith family, as well as us movie-goers. So … my Shyamalan wait continues. Greetings again from the darkness. For those of us who enjoy trying to make sense of the unexplainable, M. Night Shyamalan is one filmmaker for whom we always hold out hope. 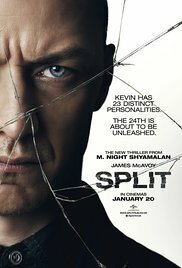 Wisely backing away from the director’s chair this time, Mr. Shyamalan created the story and produced the film. While not extraordinary, it is one of his best in quite awhile. The beauty of the story is its simplicity. It is actually presented to us in the form of folk legend through the narrator. Basically, the devil sometimes takes human form and proceeds to steal souls … often in the process, innocent (and not so innocent) people are killed. Here five seemingly random people end up in the same elevator and all hell breaks loose (literally). The detective called to the scene is battling his own internal demons and, of course, that plays a major role in how the story develops and ends. A mechanic (Logan Marshall-Green), a young woman (Bojana Novakic from Drag Me To Hell), an old woman (Jenny O’Hara), a security guard (Bokeem Woodbine) and a mattress salesman (Geoffrey Arend) are joined together in the claustrophobic nightmare of a stuck elevator. One by one, each is affected. All the while, distrust abounds. Chris Messina plays the talented detective trying to rescue them and fruitlessly apply logic to the unexplained happenings occurring right before his eyes. The film begins with an extended, disorienting upside-down view of downtown Philly, and then proceeds to take us through some unusual camera angles into the building, down the elevator shaft and into the lobby. This is our initial intro to the unlucky five. It’s a very interesting start to an entertaining thriller. The director is John Erick Dowdle (Quarantine) and he does an effective job of creating fear within the confined space of the elevator. He manages to create camera angles despite the lack of space. The use of the security camera and booth is brilliant and allows the viewer to be both inside and outside … both are frightening in their own way. Welcome back, Mr. Shyamalan! SEE THIS MOVIE IF: You can suspend disbelief and enjoy a creepy thriller OR if just the thought of being stuck in an elevator makes you queasy and weak in the knees. SKIP THIS MOVIE IF: Your idea of a great weekend is a documentary festival OR if just the thought of being stuck in an elevator makes you queasy and weak in the knees.